Former Kyrgyz president Kurmanbek Bakiev purchased a house in Minsk and Belarus nationality? 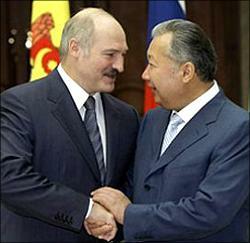 Lukashenko and Bakiev - We belong together! According to various media sources in Belarus, the former Kyrgyz president Kurmanbek Bakiev who fled to Belarus almost two years ago after the April 2010 revolution, has recently acquired a $2 million house in Minsk in addition to Belarusian citizenship obtained back in 2010. This information has however not been officially confirmed or refuted. The Belarusian ministry of interior has refused to disclose any information regarding Belarusian citizenship for Bakiev or members of his family. “Citizenship information is confidential and is not liable to disclosure”, says an official spokesman of the ministry of interior Konstantin Shalkevich, cited by RIA Novosti. One may recall that Kurmanbek Bakliev who fled Kyrgyzstan along with his son and brother following the April 2010 revolution was later accused of mass killing and has been wanted by Interpol.